Contact lenses that deliver drugs directly to the eye win health care prize « Adafruit Industries – Makers, hackers, artists, designers and engineers! A team from a Harvard Medical School affiliate saw its way clearly to victory at last night’s MIT Sloan Healthcare Innovation Prize competition, with contact lenses that deliver medications directly to the eye over days or weeks. 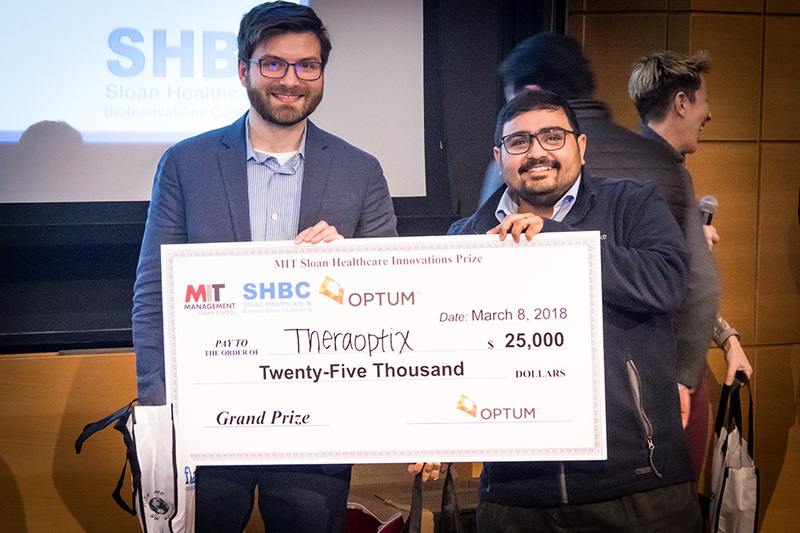 For its novel invention, Theraoptix took home the annual competition’s $25,000 grand prize, sponsored by health services firm Optum. In total, eight finalist teams pitched health care innovations to a panel of expert judges, from Optum and several local venture firms, and a capacity audience at the MIT Wong Auditorium in the Tang Center. Winning a second-place prize of $2,000 was Strand Therapeutics, which is developing mRNA-based cancer-fighting drugs. A $500 audience-choice prize was awarded to Healthcare Hospitality Systems, developing directional sound systems for hospital rooms. Made from FDA-approved materials, Theraoptix’s contact lenses deliver eye medication in a controlled, sustained release. Sandwiched between contact lens material is a drug-filled polymer film, formed into a tiny circular strip that doesn’t interfere with the wearer’s vision. The sandwiching structure causes the drugs to slowly seep from the film into the eye. The lenses can be worn all day for up to two weeks to treat, say, glaucoma or to aid in healing after surgery. Eye drops are the traditional treatment method, but they can be ineffective, as the liquid drips out of the eye or patients may stop treatment. Moreover, the lenses can effectively deliver drugs to the back of the eye to treat macular degeneration, diabetic retinopathy, retinal vein occlusion, and other diseases that today require in-office injections. “No eye drops, no injections — just one lens,” said team member Lokendra Bengani, a postdoc at Schepens Eye Research Institute of the Massachusetts Eye and Ear Infirmary, during the team’s winning pitch. Theraoptix’s core technology was developed nearly a decade ago in the lab of Dr. Daniel Kohane (now at Boston Children’s Hospital), located at David H. Koch Institute Professor Robert Langer’s lab at MIT, by ophthalmologist Joseph B. Ciolino, Bengani’s mentor at the Massachusetts Eye and Ear Infirmary. Second-place winner Strand Therapeutics is developing a therapeutic that combines engineered mRNA, which relays messages for cells to create proteins, with certain immunotherapies, which trigger the body’s immune response to fight cancer. The idea is the mRNA will help cells produce target cancer-killing proteins during immunotherapy. In the team’s pitch, Jacob Becraft, an MIT PhD student in biological engineering, showed preclinical trial results of the combined therapeutic, which extended survival rates of cancer patients by a couple months compared to immunotherapy alone. Additionally, mRNA-based therapeutics are safe, easy to deliver, and relatively cheap to produce, according to the team. “With Strand Therapeutics, we believe there is finally a market opportunity to cure cancer,” Becraft said.